One of the foremost threats to the effective safekeeping of a museum or gallery’s paper-based collection is changes in the humidity. IPCH’s Dr. Paul Whitmore and Dr. Catherine Stephens are recipients of a grant from the Division of Preservation and Access of the National Endowment for the Humanities (NEH) for their project Effects of Relative Humidity Fluctuations on Paper Permanence. 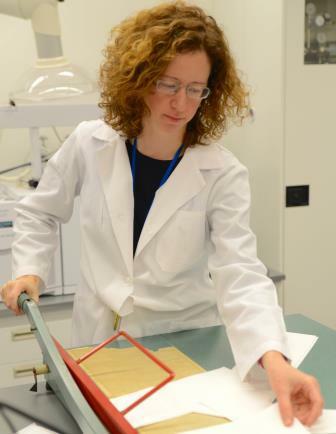 The work will examine chemical and physical degradation in paper as a result of “cycling humidity”, an environmental condition experienced by collections with little or no humidity control. This project will build upon a 2001 study conducted by Dr. Whitmore examining the degradation of rag paper when exposed to humidity cycled between 25% and 75% every two hours at room temperature. The second phase will explore key factors that determine the magnitude of risk: paper composition, humidity range, and cycling speed. Three different types of paper (rag, acidic newsprint, and alkaline book paper) will be tested to assess physical and chemical changes that occur during different environmental conditions. Molecular weight, tensile strength, elasticity, color, and moisture content will be assessed to gauge the effects of fluctuations on each type of paper. The Yale project was announced today as part of a $21.8 million investment by NEH to support vital research, education, and public programs in the humanities, including pioneering chemical testing procedures to safeguard fragile historical materials displayed in museums. The NEH is an independent federal agency created in 1965 and one of the largest funders of humanities programs in the United States.